To create a "Centre of Knowledge and Excellence" this will propagate the culture of India and its holistic values in surroundings driven by modern technology and a focused pursuit of the intellect. The focus is on nurturing well-rounded personalities with the skills to excel in the world they will inherit in time. We have a team of teachers and academicians amidst us who are highly experienced and are regarded as institutions in themselves. Their constant supervision shall ensure that the quality shall never be compromised. The school follows a 360 Model wherein all the people involved shall work towards one mission - EDUCATION FOR LIFE. 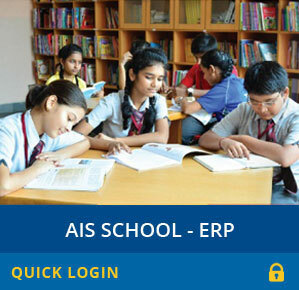 The main mission of AIS is to envisage that students will learn, develop, and grow in the competitive arena in Today & Tomorrow. Education for Life is a philosophy of holistic education that emphasizes experiential learning, spiritual development, and practical skills for living such as concentration, self-discipline, and compassion. Education for Life emphasizes learning that will last a lifetime because we at AIS believe that education is the only aspect in life which cannot be taken away from an individual.